If you live in Lafayette, Indiana, and both of your parents attended Purdue, your Boilermaker blood runs deep. That’s the case with Dan Bollock (BSME ’87), who grew up an avid Purdue football and basketball fan. 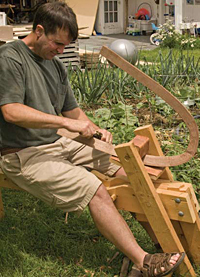 Backyard Builder: Dan Bollock shapes a leg for one of his chairs. When he enrolled at the University himself, mechanical engineering was an ideal match for his skills. “Being strong in math and science in school, engineering seemed like a good fit. I liked the challenge of problem solving,” he says. It also started him on the path toward becoming an accomplished woodworker and artist. A self-employed artist, he draws furniture plans, makes the pieces and puts them in stores. The resulting direct sales represent half of his work; the other half he attributes to commissioned work. For the past five years, Bollock has displayed his pieces at the Artists’ Own art co-op in Lafayette. Recently Bollock’s education and artistry joined forces when two of his art pieces were added to Purdue Engineering’s Neil Armstrong Hall. Dean Leah Jamieson had contacted Artists’ Own, seeking original artwork to display in the hall, and Bollock sketched two wall sculptures ultimately selected — one added to the dean’s personal office and the other displayed in the office’s large conference room. And across campus, visitors to Purdue’s Hicks Undergraduate Library will find high-end cabinets he created that display letters and paraphernalia from Purdue astronauts. Rich in detail, Bollock’s additional artwork includes boxes, bowls and kitchenware. To create his pieces, he primarily uses Indiana lumber, often from trees he felled. “I’m a one-man show, really,” he says. At home, however, his team includes his wife, Sarah, and two young daughters, Maggie, 4, and Abby, 2.